A lawyer at the center of a controversial real estate deal between New York City and a pair of felonious landlords has what one report calls "unfettered" access to Democratic mayor Bill de Blasio's City Hall. Frank Carone, a longtime friend of de Blasio, donated money to his federal political action committee in the midst of a lucrative real estate deal between City Hall and his clients, the Podolsky brothers. Carone has sent numerous requests for jobs in de Blasio's administration and "regularly asked the mayor's office to intervene" on behalf of his clients who were at impasses with city agencies, the New York Daily News reported. According to the report, senior de Blasio staffers would frequently respond with pledges to look into whatever issues Carone had. Carone has been the counsel for the Brooklyn Democratic Party for nearly 10 years. 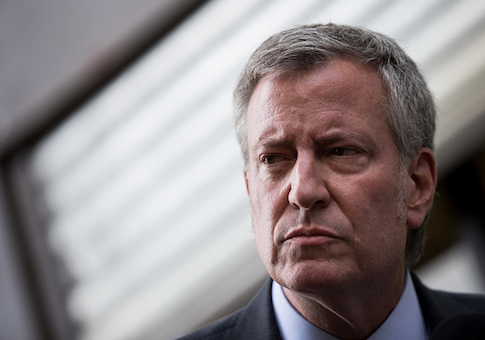 He denied asking for special favors from de Blasio in a statement to the Daily News. "If I believe in the integrity and qualifications of a person, I pass their resume along," Carone said. "I have been friends with the mayor for many years. We discuss issues which affect our city, state, family, sports. I do not ask the mayor for any favors on behalf of clients, nor do I expect he would tolerate those questions or act on them." Their relationship is again under scrutiny after New York City closed a $173 million deal to purchase 17 buildings in Brooklyn and the Bronx owned by Stuart and Jay Podolsky. The landlords have a lengthy record of housing violations. According to the New York Times, the buildings, which will be turned into affordable housing developments, were initially estimated by city officials to be worth $50 million. A private appraisal later determined their worth was $143 million before City Hall closed a deal last week to pay $173 million, more than a 70-percent increase value from the initial estimate. The Times reported Carone donated the maximum $5,000 to de Blasio's federal political action committee Fairness PAC during negotiations. He also solicited others to donate to the PAC. Carone denied anything shady about the deal, noting how far back he went with the Podolskys. "It was only natural for myself and my team to represent the family in its eminent domain negotiations with the city," Carone said in. statement. "Ultimately, all parties came to an agreement on what an amicable settlement would look like." The Podolskys served five years probation in the 1980s for grand larceny and coercion, according to New York real estate site The Real Deal, after Manhattan investigators discovered the family hired "professional vacaters" to force out tenants from their properties. They are currently under federal investigation for tax fraud. This entry was posted in Politics and tagged Bill de Blasio, New York. Bookmark the permalink.